Lake Tahoe, Calif. -- The first webisode in a new series entitled New Hights featuring US Olympic snowboarder Elena Hight is now live online. 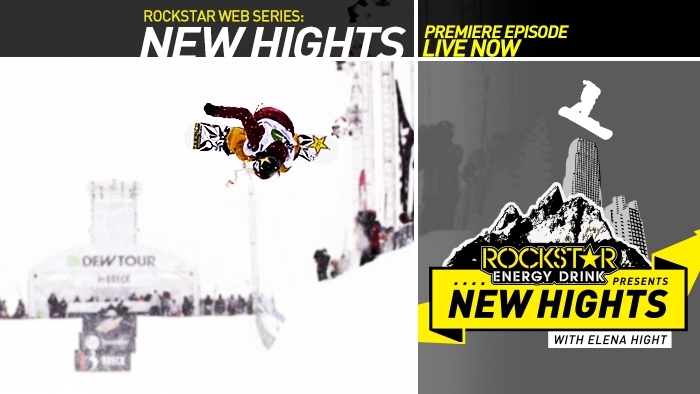 The four-webisode series was produced by Rockstar Energy and follows Hight during her 2013 winter season, from rehabbing a hip injury to creating history in women’s snowboarding with a groundbreaking trick in the halfpipe at X Games Aspen. Elena Hight is one of snowboarding’s premier athletes. At age 23, she is already a two-time Olympian, having represented the US in the halfpipe in Turin and Vancouver. After a record-breaking year for Hight, she has her sights set on the chance to represent the US again in Sochi. In the premiere episode of New Hights, viewers will see a recap of Hight’s summer in southern California, which concentrates on hip rehabilitation as she prepares for the 2013 competition season. It then follows Elena to her first contest in Breckenridge for the Winter Dew Tour. The episode closes with Hight back in her hometown of South Lake Tahoe for a Rockstar trip at Sierra Mountain, where she connects with teammates Chas Guldemond and Mason Aguirre to ride with high schoolers from around the country for the winter S.W.A.T. tour. Run-time on the episode is seven minutes. During X Games Aspen 2013, Hight landed the first ever double backside alley-oop rodeo in a halfpipe competition by a woman or a man. This trick has taken women’s snowboarding progression to a new level; and will further challenge her fellow athletes as they look towards Sochi in 2014. And it also landed her a silver medal in Aspen. Episode #2 will launch on May 13.